January 29th, 2016. Bandai's online virtual pet evolved to Adult-level today, unlocking another tier of rewards in Digimon World -next 0rder- and Digimon Linkz. The social media campaign depends on fan tweets to progress, with each tweet representing a "Care" function like on the original Digital Monster pets. At the 12,000 mark fans unlocked an additional Chain Melon for -next 0rder- on top of previous rewards, and eight Digistones for Linkz. 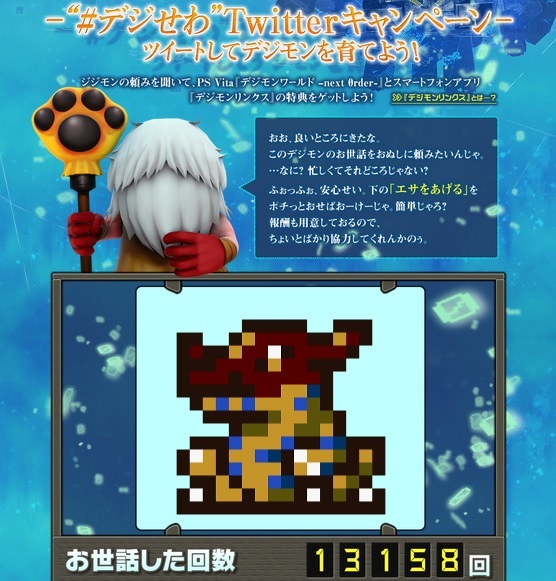 At the 15,000 mark Greymon will evolve to Perfect-level, earning fans one more Chain Melon and ten additional Digistones (a total of five Melons and 25 Digistones). The Melons extend a Digimon's lifespan, while Digistones restore stamina. Previously, the Digimon had evolved to Agumon on the 26th, and Koromon on the 25th. Fans can participate in the campaign by going to the page and clicking on エサをあげる ("Give food") which will create a premade tweet for them to share. Digimon World -next 0rder- will launch in Japan March 17th, 2016, on the PlayStation Vita. Digimon Linkz will launch in 2016, on Android and iOS.